Dewatering pumps are your standard gas-powered water pump. Their job is to remove water and displace it somewhere else. Dewatering pumps are commonly used to empty hot tubs, drain ponds, or move other types of clean water. 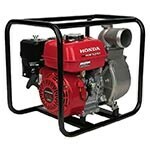 With gas-powered engines, these pumps can move a lot of water in a hurry. If you need to pump water with debris or solids in it, you'll need to look to a trash pump instead. Trash pumps are built to transfer water containing debris and solids up to 2" in diameter. Our diverse stock of trash pumps includes diaphragm and chemical pumps as well. PRO TIP: If you need to pump agricultural or industrial chemicals, you'll want to consider a chemical pump. For pumping water with stringy weeds or lots of leaves, get a suction hose with a strainer attachment. If you need to operate the pump indoors, get an electric-powered water pump instead. 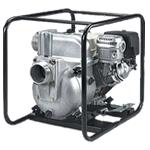 Although a PTO pump itself does not have a gasoline engine, it's powered by a tractor's gas engine. Power is garnered from the engine's drive-shaft, which in turn pumps the water. PTO pumps are popular with farmers and large landowners as they require a tractor to operate. Harnessing the muscle of a tractor, PTO pumps are pretty much unrivaled in terms of power. With no engine to maintain, the solid construction of the pumps allows for years of quality use. Gas Water Pump Buyer's Guide - Find Out How to Pick the Perfect Gas Water Pump. Our water pump how-to library can help you pick the perfect dewatering pump, submersible pump, trash pump or water pump accessory.